Poaching of Sumatran tigers has not shown any sign of decreasing. During 1998/99 WWF and TRAFFIC collected tiger poaching data and concluded that at least 66 tigers had been killed in the last two years in central and southern Sumatra. This is equivalent to 20% of tiger population of three-quarters of the island. 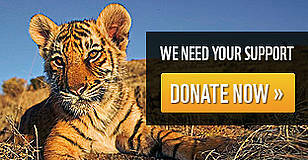 More than half of the tigers killed are from protected areas. Bukit Tigapuluh National Park in Riau has lost at least 6 tigers in the last 2 years. The tiger population status in this park is unknown and patrols by the park rangers are ineffective. This project intends to gather information on the tiger population and launch anti-poaching units. It will collaborate with the Sumatran Tiger Project, which has been running in Way Kambas over the last three years. It will also seek to build on earlier projects in this area which focused on community based conservation and trade monitoring (ID0117 and ID0164). The wild Sumatran tiger populations are extremely threatened because of habitat loss and poaching. Most wild Sumatran tigers are found in protected areas of the Leuser ecosystem, Kerinci Seblat, Bukit Tigapuluh, Berbak, Bukit Barisan Selatan and Way Kambas. The World Bank (referring to FAO research) reported the increased deforestation in Indonesia from 600,000 hectares per year in 1981 to 1,000,000 hectares in 1991. More recent estimation from the The Regional Physical Planning Programme for Transmigration (RePProt) and the Ministry of Forestry and Estate Crops found 1,600,000 hectares of annual deforestation between 1985 and 1998. It is strongly suspected that significantly higher deforestation rates occurred after the economy crisis in 1997. In addition to this, poaching of Sumatran tiger remains high. Tiger parts were easily found for sale in common markets in big cities of Java and Sumatra in 1999. Trade investigations carried out by WWF in 1998 and1999 concluded that at least 66 tigers have been killed in those two years in central and southern Sumatra. The same investigation by Ron Tilson and Traylor-Holzer in 1994 concluded that 36 tigers were poached annually. There have been at least 207 tigers poached between 1994 and 1999. This is equivalent to about one-third to half of wild Sumatran tiger populations. Moreover, more than half of the tigers killed are from protected areas, indicating that the patrol system is not effective. Law enforcement for tiger poachers has been weak because judicial officers are not sufficiently familiar with the Conservation Act (which assigns much heavier sentences than common criminal law), and law enforcement officers do not have sufficient knowledge to identify tiger parts. Market demand for tiger parts in Indonesia is for both export (supplying traditional Chinese Medicine) and domestic market (skin, teeth). Indonesia is unique in that it is an exporter as well as a consumer of tiger parts. In the WWF Global Tiger Action Strategy Workshop recently held in Indonesia, BBS-KS-B30 (Bukit Barisan Selatan - Kerinci Seblat - Bukit Tigapuluh) landscape was recognized as one of the priority tiger conservation units (TCUs). More than half of wild Sumatran tigers inhabit this TCU. It is proposed that WWF-US participate in activities pursuing objectives 1 and 2. The other components are supported by WWF-UK, WWF-NL, WWF International and EAPEI (East Asia and Pacifice Environmental Initiative) funds from the US State Department. The Tiger Foundation will be also funding activities to pursue objectives 1 and 2. Funds from WWF-US will be also used for the operation of anti-poaching units and camera trapping activities. Immediate action is needed to curb poaching of wild Sumatran tigers. In particular, a patrol system needs to be introduced in Bukit Tigapuluh National Park. Other pockets of tiger habitat (Leuser, Kerinci Seblat, Bukit Barisan Selatan and Way Kambas) have had anti-poaching patrols operating (though some are not specifically for tigers). However, to prevent poaching of wild Sumatran tigers, it is not enough to simply deploy anti-poaching patrols in tiger habitats. Rather, market demand for tiger parts also needs to be stopped.